A luscious confection of vanilla-scented poached pears, a brittle meringue case, flurries of cream and a scandalously rich caramel sauce. This isn't a dessert you can rustle up in an instant - it takes time and effort to prepare - but I hope you will give it a bash, because I reckon you (and your guests) will be delighted by the result. 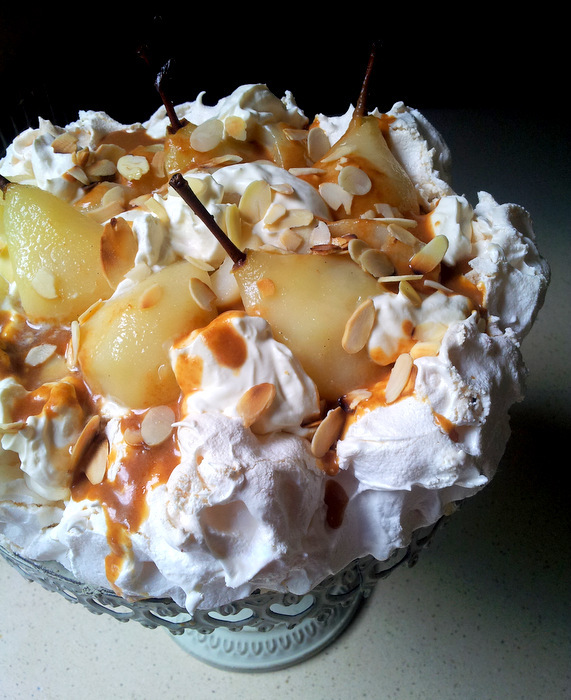 Winter Pavlova with Pears, Mascarpone & Caramel Sauce. Classic Pavlovas have a slightly squidgy centre, but this is a rather dryer version, because I'm a fan of crackly meringue that's as white as snow and crumbles to a sweet dust in your mouth. Admittedly, this isn't easy to achieve when you're baking such a large volume of whipped egg white, because much depends on your oven, the freshness of your eggs, the humidity in your kitchen, and the other vagaries of the sugar/egg relationship. I'm not a natural when it comes to any type of meringue - damn, it's tricky to make - but after much experimentation I've found that a slow drying-out process is the way to go. What makes this dish special is the lovely taste of home-poached pears. 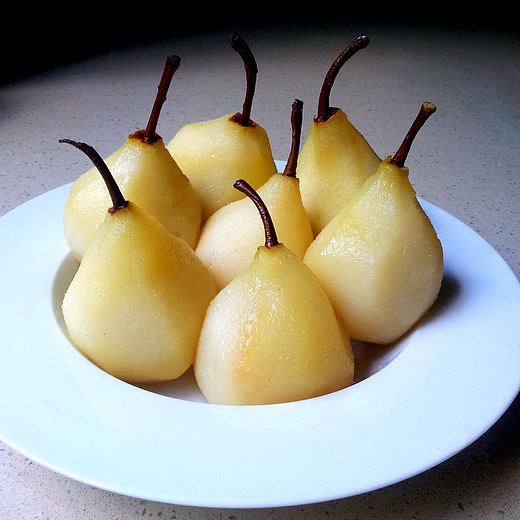 You can use any variety of pears for this recipe, provided they are small, sweet and just ripe. Yes, I know this is a tall order, because most pears are perfect for 20 minutes before they collapse into a floury mush. But there are ways around this - please see my Cook's Notes at the end of this page. If you're in a hurry, feel no shame in using excellent South African tinned pears. 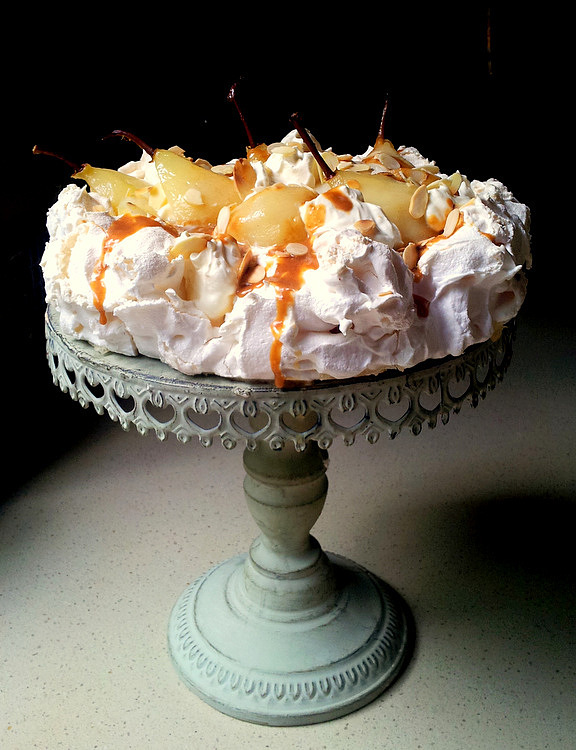 Your finished Pavlova won't look as glamorous, sure, but it will still taste glorious. And please keep the syrup for poaching other fruits. I put some cut-up guavas into the left-over syrup to cook, and my daughter described them as tasting of 'flowers and happiness'. Using an electric beater or a food processor fitted with a balloon whisk, beat the egg whites until they are standing up in stiff, dryish peaks. Line a metal baking sheet with baking paper (put little blobs of meringue on six points under the paper to stick it down). Draw a circle on the paper, using a dinner plate as a template. The meringue should be very thick & glossy. Spread a third of your meringue mixture over the paper, in an even circle. The easiest way to do this neatly is to place a pile of meringue in the centre of the circle, and then - using a palette knife - gently press down and out to create a neat, swirling circle. 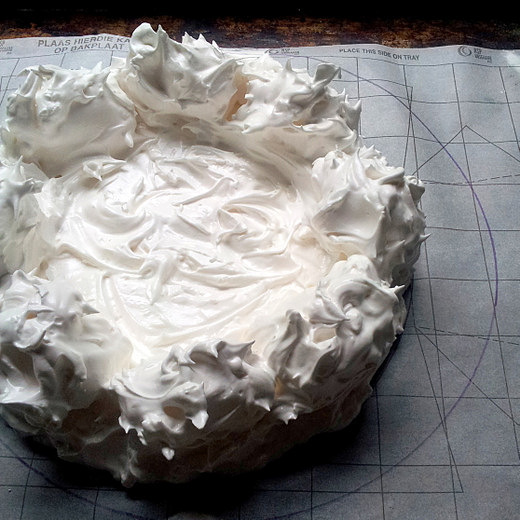 Now place generous dollops of the remaining meringue around the edges of your circle (see picture; left). Place the baking sheet on the middle rack of your oven, and immediately turn the heat down to 110 ºC (oven fan off). Bake for for an hour and a quarter then switch off the oven (don't open the door!) and let the meringue case dehydrate for for at least 8 hours, or until it is crisp and dry. In the meantime, prepare the pears. Fill a large bowl with cold water and squeeze in the juice of half a lemon. Using a potato peeler, neatly remove the skin from the whole pears, leaving their stalks intact. Drop each pear, as you've peeled it, into the bowl of lemony water. The syrup is flavoured with vanilla & lemon. To make the poaching syrup, place the water, sugar, vanilla pod and lemon slice in a saucepan, set over a medium heat and bring to the boil. When the syrup begins to bubble, stir it gently until all the sugar crystals have dissolved. Simmer the syrup for a further 5 minutes. Place the whole pears in the syrup and bring up to a gentle simmer. Cover the pot with a lid, turn the heat down to its lowest setting, and poach the pears for 5-8 minutes, or until they are just soft. Let the pears cool completely. 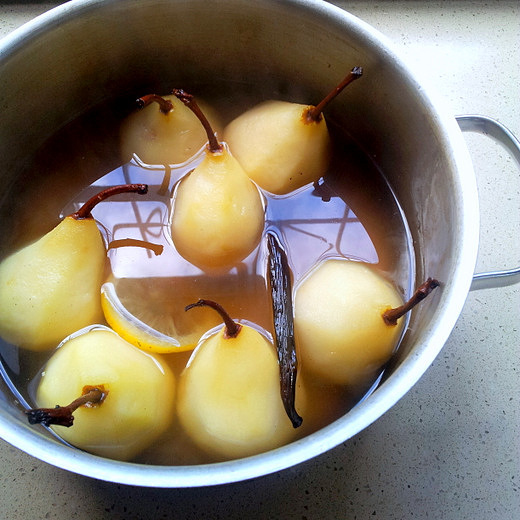 Fish the pears out of their poaching liquid and set aside on a plate to cool. Cut them in half lengthways, leaving a stalk on one half. Using a teaspoon or your thumbnail, gently pop the oval core out of each pear half, tearing it up towards the stalk to remove the fibrous threads. Put the mascarpone into a bowl and beat it thoroughly until smooth. (It helps to leave it at room temperature for a few hours, until softened.) Whip the cream to a soft peak in a separate bowl, add the vanilla, and gently fold this into the mascarpone. To make the caramel sauce, spread the caster sugar evenly over the bottom of a dry, thick-based frying pan, and sprinkle over the water. Cook over a medium-high heat until the caramel is dark, rich golden brown, swirling the pan to distribute the dark-gold areas (see Cook's Notes) Whisk in the cream, and then add the butter. Stir well and set aside to cool. To assemble the Pavlova, fill the centre with two-thirds of the cream/mascarpone mixture, and arrange the pears on top, stalks pointing up. Place blobs of the remaining cream on top. Drizzle over the caramel sauce, and scatter the almonds on top. 1. The meringue must be really, really stiff and glossy, or it will collapse in the oven. 2. The caramel sauce I've used here is loosely based on Gordon Ramsay's recipe. This is arguably the trickiest part of this recipe, as caramel is temperamental: not only does it burn with alarming speed, but it also has a tendency to crystallise for no apparent reason, If your caramel suddenly turns thick and grainy after the sugar has melted, it cannot be rescued. Tip it into the bin, and start again in a new dry frying pan. Don't stir the caramel, and use a pastry brush to sweep any grains of sugar off the sides of the pan as it is heating. 3. To catch pears at their peak, place them in your fruit bowl alongside other fruits, which will hasten the ripening process. Check them twice a day by firmly pinching the flesh just below their stalks - when this is just soft enough to yield to the touch, peel and poach them, as described above. You can keep the pears, whole their syrup, for many days, until you're ready to make this dessert. a master at work, it looks too beautiful to eat Jane! It looks glorious and the caramel is a nice touch of elegance, instead of that darn ol chocolate sauce again!